Arkup avant-garde 100% Electric Solar 75 ft. Livable Yacht : Atlantic Yacht & Ship, Inc.
Arkup is a 100% Electric Solar 75 ft. Livable Yacht. The vision for Arkup came with realization that urban growth, rising seas and renewable energy independence is a challenge for our generation and ones to come. The concept of life on the water was the solution to these challenges. 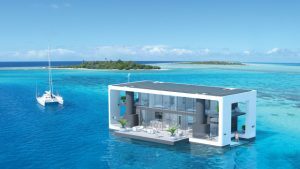 The idea of floating houses has become very popular around the world. Arkup incorporated what they consider the best features of what yachts, floating houses and waterfront villas have to offer. The most desired feature is the ability to move you home wherever you choose. Arkup has designed a livable yacht that can cruise silently, allow for stationary living or use its hydraulic spuds to raise the vessel up. Having hydraulic spuds allows the structure to avoid the effects of waves and tropical winds. Designed to withstand wind speeds up to 135 knots. Built to the ABYC and U.S. Coat Guard’s recreational standards. In order to operate Arkup, a standard U.S. driving license and yacht insurance is required. The first Arkup is currently being built in Miami, Florida. Expected completion is September 2018. Contact Bryan Carter at Atlantic Yacht & Ship, Inc. for more information.